MAY 19—St. John’s Timothy “TJ” Hindes did his research, relied in his 8 Tuff Miles racing and course training, then executed his strategy to perfection en route to burying the field and winning Saturday’s 3rd Virgin Gorda Half Marathon. 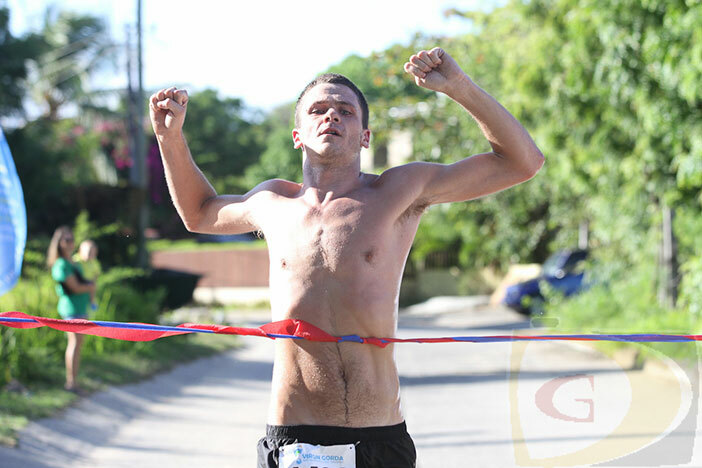 In his first trek to Virgin Gorda, Hindes wasted no time in breaking away from the field at the start, opened a sizeable gap that stretched to five minutes at one point by time he crossed the line in 1 hour 32 minutes and 34 seconds. Tortola resident Guy Williamson was second in 1:35.34 followed by Virgin Gorda’s Maxford Pipe in 1:39.37. It was the fastest time run in the three editions of the race which this year featured a tougher and more challenging course. With support from the Valley Sound Lions Club, Valley Day School, BVI Cancer Society Virgin Gorda Branch, St. Mary’s School, Animal Rescue and Control (ARC) and Raw Skillz Track Club manning water stops and cheering participants on during key segments of the event, Race Director Casey McNutt said it was important to see everyone coming out and contributing to good health. Adam D’Monte won the 6 Mile Challenge in 42.20 with Virgin Gorda resident Kathleen Brownsdon the top woman in 47.18.